Hiroshima: do the British Members of Parliament remember ? When Britain’s Prime Minister Theresa May said she'd press the nuclear button during the July 18 vote on Trident, what does that mean on the 71st anniversary of the Hiroshima bombing? Trident Part 2. Trident Part 1. During the Trident debate on 18 July, Britain's Prime Minister Theresa May emphatically declared "Yes" to the question of whether "she personally [is] prepared to authorise a nuclear strike that could kill 100,000 innocent men, women and children". Today, 6 August, is the 71st anniversary of the first use of a nuclear weapon. Over 140,000 people died when the code-named "Little Boy" uranium bomb was dropped on the city of Hiroshima in 1945. In the House of Commons debate, Chris Law, one of the 56 Scottish National Party (SNP) MPs who voted against the government motion to replace Trident, noted that "no one in this House truly knows what it is like to experience the horror, shock, pain and loss, and the complete devastation, of a nuclear strike". He recalled a survivor from the Hiroshima bombing, Setsuko Thurlow, who visited Scotland in May, after speaking at the United Nations Working Group on multilateral disarmament in Geneva. "She could be our mother, our grandmother, our aunt or our sister. She told us that in the final year of war in Japan, when she was 13 years old, the first thing she remembers of the bomb hitting was a blue-white light and her body being thrown up into the air. She was in a classroom of 14-year-olds, every one of whom died; she was the only survivor. As the dust settled and she crawled out of that building, she made out some figures walking towards her. She described them as walking ghosts, and when some of them fell to the ground, their stomachs, which were already expanded and full, fell out. Others had skin falling off them, and others still were carrying limbs. One was carrying their eyeballs in their hands. So when I hear the Prime Minister today say that she was would be satisfied to press the button on hundreds of thousands of innocent men, women and children, I ask her to go and see Setsuko Thurlow—I am sure she would be delighted to have a discussion about what it is really like to experience a nuclear bomb. 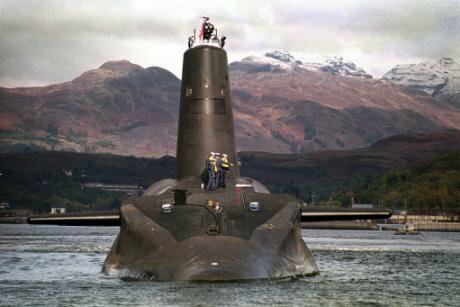 That in itself should be the complete reason why we do not replace Trident." Trident. PA/PA Wire/Press Association Images. All rights reserved. The bomb that destroyed Hiroshima was 8 times smaller than the 100 kiloton nuclear warheads deployed on Trident. And even after the "reductions" that Theresa May spoke about the UK taking, each of the new submarines is intended to carry 40 warheads. So, to get this into perspective, if the Prime Minister authorised one UK submarine to fire all its nuclear weapons, it would be 320 Hiroshimas. Since most of the chosen targets are in or near cities, the order to fire could cause an unimaginable humanitarian catastrophe to 320 cities, most of them bigger than Hiroshima. Her order would be to kill millions, not just 100,000. And potentially unleash years of "nuclear winter" and global famine. The impacts on Hiroshima and Nagasaki, together with updated studies on the humanitarian risks and consequences of nuclear detonations in today's world have come to dominate recent UN talks, with the majority of governments now arguing the need for negotiations to prohibit nuclear weapons. These UN-based multilateral efforts were raised during the Trident debate by the Labour Leader, Jeremy Corbyn, along with SNP and Green MPs. But their interventions were mocked or drowned out by the majority who seemed stuck in a Cold War time warp. The new Prime Minister appeared at first to want to engage with the arguments, posing several questions on need, costs, alternatives and disarmament, including "in the light of the evolving nature of the threats that we face, is a nuclear deterrent really still necessary and essential?" She delivered her prepared speech with confidence, but this could not hide the fact that her sturdy defence of current UK nuclear positioning illustrated the out-dated defence and foreign policy model on which the decision to renew Trident relies. What was needed was a critical appraisal of the evidence and implications relevant to her own questions. Instead, the Prime Minister resorted to attacking the patriotism of those who raised alternative perspectives, as when Green MP Caroline Lucas invited her to consider that if "keeping and renewing nuclear weapons" were vital to Britain's national security then it would be logical for all other states to get them. The logic that Lucas pointed to has been raised time and again in UN meetings, where concerns have intensified in recent years about the UK's proliferation-driving rationale for Trident replacement. May did not even attempt to refute this, but launched an extraordinary attack familiar from the 1980s, accusing Lucas that “she and some Labour Members seem to be the first to defend the country’s enemies and the last to accept these capabilities when we need them". Even proponents of Trident replacement were jarred by this smear tactic, especially since Lucas is widely considered to be one of the most rational and able MPs in parliament, and had opened with a gracious congratulation to the Prime Minister on assuming her new role. Throughout the debate Labour and Conservative MPs preferred to relive the political traumas and myths of the 1980s rather than engage with the security challenges of the 21st century. They used the term "unilateral disarmament" as an insult. In fact, apart from the 1996 Comprehensive Test Ban Treaty, the only nuclear disarmament that Britain has engaged in since the 1970s has been unilateral. Unilateral steps have also played a major role in reducing the US, Russian and French arsenals when the Cold War ended. When Vernon Coaker, Labour's Shadow Defence Spokesperson before the 2015 election, said “We can make a choice to disarm unilaterally or multilaterally, but we live in a more uncertain world", he showed that he was still trapped in how PM Margaret Thatcher and then Defence Secretary Michael Heseltine framed their advocacy of more nuclear weapons in the early 1980s. Recently released Cabinet Papers from that time show how this was a deliberate PR policy to undermine the growing popularity of peace movement arguments for nuclear disarmament. In today's reality, unilateral and multilateral disarmament steps – as well as bilateral (US-Russian) and plurilateral measures (involving some or all of the nuclear-armed states) – are enshrined in UN and Non-Proliferation Treaty (NPT) agreements as parallel and complementary approaches – all valid and necessary to comply with the treaty's disarmament as well as non-proliferation obligations. In the six-hour parliamentary debate, most MPs ignored the UN developments, and behaved as if the NPT permitted or even authorised Britain to keep and renew nuclear weapons in perpetuity, as Tony Blair had claimed when arguing for Trident renewal in 2007. He was wrong, as pointed out by two directors of the International Atomic Energy Agency (IAEA), Dr Mohamed ElBaradei and Dr Hans Blix. In fact, the NPT carries a legally binding nuclear disarmament obligation, which has been strengthened with consensus agreements in 1995 (when it was extended), 2000 and 2010, to pursue unilateral as well as multilateral, bilateral and plurilateral nuclear disarmament steps. Another throwback to the 1980s was the repetition of the phrase "independent nuclear deterrent" in the motion and dozens of speeches by its supporters. The Trident nuclear weapons system is anything but independent, taking even its name from the US-built and owned Trident D5 missiles that the UK pays to lease from a pool kept at King's Bay naval base in Georgia. The 'independent deterrent' mantra doesn't change the facts, but these phrases successfully enable MPs to avoid inconvenient truths and questions. It was a sobering exercise, as well as quite funny, to count the continuous in-House deterrent deployments. Sir Edward Leigh (Conservative) crammed eight repetitions of "independent nuclear deterrent" into one of the shortest interventions in the debate. Theresa May referred to Trident as our "deterrent" 33 times in her speech. Which leaves her and the rest of us more vulnerable and unprepared for when this deterrent fails to deter. The danger in this PR jargon is that it gets believed, leading to complacency and bad decision-making. When the Prime Minister dramatically answered "yes" to the question about firing Trident at cities full of people, posed by George Kerevan (SNP), she added: "The whole point of a deterrent is that our enemies need to know that we would be prepared to use it." That was one of the Cold War versions of deterrence theory, but it's fallen out of favour as it depends on having accurate information and analysis, unambiguous communications and correct psychology. As these tend to be in short supply at times of crisis and conflict, Henry Kissinger and others now describe the role of nuclear weapons in deterrence as "precarious". In reality, the point about nuclear deterrence is that if a leader is put in the position of deciding whether to fire these weapons of mass destruction, deterrence has already failed. Or else the computers are giving out false information. The Prime Minister was cheered and congratulated by her backbenchers. Commending her for her "strength and clarity", Conservative MP Tom Tugendhat spoke for many when he said, "Our place is at the top table, guaranteeing the international order and the freedoms and liberties of our friends. When I hear talk of unilateral disarmament and appeasement, I hear talk not of honour and morality but of dishonour and immorality." 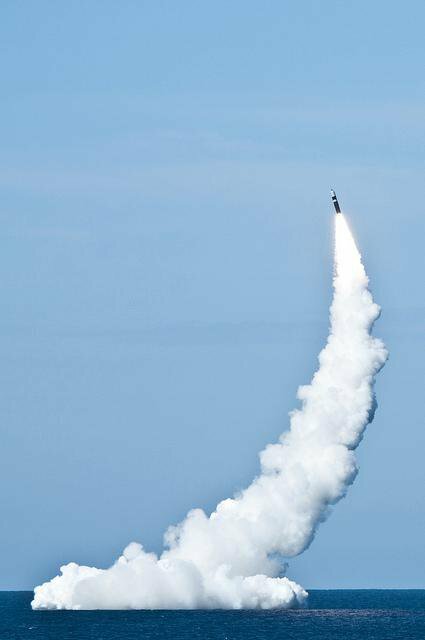 In his view, "the capability and purpose of the nuclear deterrent lies in its not being so measurable or controllable… It works not because of its first-strike capability—any fool can have a first-strike capability—but in the second strike. It works not as a weapon of aggression but only as a post mortem weapon." Owen Thompson (SNP) highlighted that if the Prime Minister orders Trident to be fired it would be in retaliation or revenge, and spoke of the "worldwide famine" that could cause. Thompson was also aware of the dangers of mistakes and accidents. Referring to his parliamentary efforts to end the transporting of nuclear warheads between nuclear bases in England and Scotland, he noted that these unmarked truck convoys drive through his Midlothian constituency near Edinburgh: "If we do not have the nuclear weapons, we do not need the nuclear convoys, and we can reduce the risk to those in our communities." Risks as well as costs were raised by Crispin Blunt, the Conservative Chair of the Foreign Affairs Select Committee. Blunt made three essential arguments for why he would defy the Conservative whip and vote against his own government: costs of Trident replacement; opportunity costs - the need to prioritise funding for Britain's real defence requirements; and technical risks likely to make the submarines obsolete and unfit for the purpose of deterrence operations. Blunt, a former army officer and adviser to former Defence Secretary Malcolm Rifkind, had crunched the government's own numbers, so his calculation that replacing Trident would cost at least £179 billion was widely quoted. This is not much below the £205 billion estimate from CND, which had added in the cost of decommissioning. In response to the Prime Ministers who had said "we do not believe that submarines will be rendered obsolete by unmanned underwater vehicles or cyber-techniques," Blunt described the development of a host of technologies that will breach the trumpeted invisibility and invulnerability of the submarine-based version of "the deterrent" by making the oceans "transparent", including "distributed censors detecting acoustic, magnetic, neutrino and electromagnetic signatures, on board unmanned vehicles in communication with each other, using swarming algorithms and autonomous operations associated with artificial intelligence, able to patrol indefinitely and using the extraordinary processing capabilities now available and improving by the month..." Referring to history's "dreadnought blind alley", Blunt concluded that replacing Trident "does not pass any rational cost-effectiveness test". Regardless of that, for Labour MPs especially, the main justification for renewing Trident was jobs, with John Woodcock leading the way. He intervened as often as he could, mainly to attack his own party's front bench and the SNP. Most MPs gave him kind leeway, recognising his desperation as the MP for Barrow, where the submarine contracts would provide jobs in a run-down port that had once had a thriving and diverse ship-building industry. But over the years BAE Systems and others had narrowed the options, making Barrow utterly dependent on BAE defence contracts. Barrow's vulnerability, however, needs to be viewed in the broader context of declining defence jobs, as well as the hundreds of thousands of jobs across all areas of British life that the government put at risk in the Brexit referendum. Labour Party leader, Jeremy Corbyn, underlined the need for a defence diversification agency to work with the unions and "support industries that have become over-reliant on defence contracts and wish to move into other contracts and other work". Ian Blackford (SNP) also put the jobs issue in context: "investing in conventional defence and taking care of our responsibilities in respect of terrorism, not investing in rusting hulks that will do nothing for humanity and nothing for our defence." He, too, questioned the Prime Minister's determination to press the nuclear button, asking, "Have we forgotten the lessons of Hiroshima?" Part 3 of this series will be published on the 9th August, Nagasaki Day.